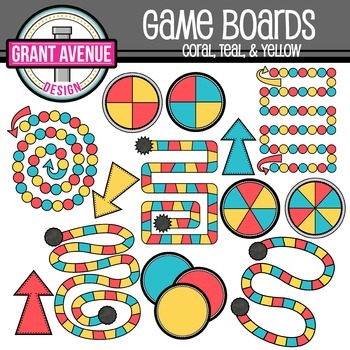 Game Boards Clipart - Coral, Teal, and Yellow Gameboards Clip Art are perfect for creating your own games for your classroom! Included are 15 vibrant, colored images and 10 black and white images. There are 5 different game boards, various spinners, and arrows. Perfect for all your games and activities!